Ahmad Fazrul Sham’s return to the PETRONAS AAM Malaysian Cub Prix has finally starting to show good promise when the Yamalube AHM rider posted the fourth fastest time in Timed Practice session in the CP130 class in Kuala Terengganu, Terengganu, the best for Yamaha so far. 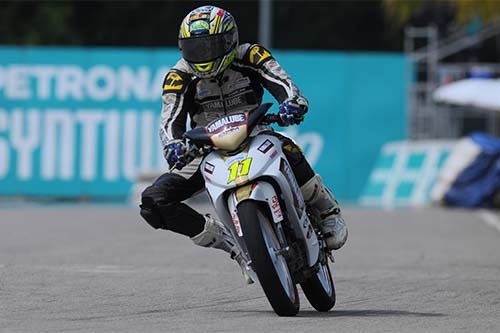 Fazrul who managed fourth place in Muar this time displayed his long overdue abilities to sweep clean corners and push hard out on the straights to time 41.504s behind fastest riders, Mohd Hafiz Nor Azman, Mohd Zamri Baba and Norizman Ismail. 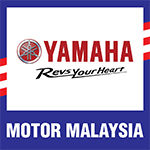 Second best Yamaha finish was made by Ahmad Fazli Sham of PETRONAS Yamaha Maju Motor. Fazli clocked in 41.587s in sixth behind Elly Idzlianizar Ilias while Mohd Fitri Ashraf Razali timed41.590s in seventh ahead of Fazrul’s teammate, Mohd Haiekal Akmal Zakaria (41.648s) in eighth and Fitri’s teammate, Mohd Affendi Rosli in ninth. In the CP115 category, Kasma Daniel Kasmayudin stole the spotlight as the fastest rider despite pressures from more experienced riders, namely Mohd Izzat Zaidi, Mohd Emir Firdaus Hasan and Ahmad Abdul Kadir. The PETRONAS Yamaha Maju Motor rider made best time in his sixth lap in 41.620s while Izzat of Motul Yamaha YY Pang came in second in 42.151s. Emir managed third fastest ahead of Izzat’s teammate, Ahmad who timed 42.322s in fourth. Mohd Izzat Rafiq became Yamaha’s fastest rider in the Wira class, fifth overall behind Mohd Shafiq Ezzariq, Amirul Hakim Mohd Rizal, Mohd Khairul Ikhwan Ajis and Saiful Izman Ahmad Zamani.